It’s a surgical procedure used to visualize, diagnose, and treat problems inside a joint. A small incision is made on patient’s skin and then inserts pen-sized instruments that contain a camera to magnify and visualize the structures inside the joint. 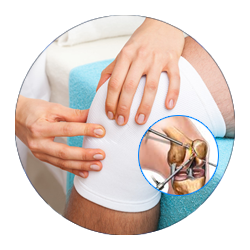 Arthroscopy is used to confirm the diagnosis made through history, physical examination and Radiological investigations (X rays & MRI), Once diagnosis is confirmed treatment can also be done through arthroscopy. Synovitis: inflammation of the joint lining. Minimal incision – less blood loss, decreased infection rate, faster recovery.